🏔 Au Pays du Mont-Blanc we are lucky to have 💦 several swimming lakes with stunning mountain views . . . while the perfect spot for strolling and biking in autumn and winter, come the balmy days of spring and summer, the water warms and the lakes start to get busy with bathers and ⛵️ watersport enthusiasts (at Lac de Passy and Lacs des Ilettes: windsurfing, paddle boarding, SUP yoga, sailing, pedalos). We are also spoiled with 🏔 natural mountain lakes (ideal for a hike or an iconic snowy mountain reflection photo) and 🎣 some fishing lakes too. Further afield (but not too far away) in 🇫🇷 Haute-Savoie & Savoie 🇨🇭 in Switzerland, and in 🇮🇹 Italy are more swimming lakes, some with lovely sandy beaches. The 🏕 campsite Mont-Blanc Plage (right next to Lac de Passy) has a lovely terraced restaurant decorated with pots of flowers, that looks out over its own private lake (with 45 year old carp, the odd duck, and beautiful water-lilies) . . . if you eat lunch or dinner at the restaurant, then you are allowed to swim in the lake – there is a slide, a diving board and rafts to swim out to. There is a jaded grandeur to this campsite and the restaurant is very tranquil. And there is the added bonus of having a swim, a jump or a slide after eating! Praz-sur-Arly is planning a 💦 new plan d’eau near the Base de Loisirs des Belles / for more information, read an article from Praz-sur-Arly Mairie here. A visit to the small 💦 Lac de l’Etape in Les Contamines-Montjoie is such a bucolic visit en famille . . . you can either hike up there with older children (or take a 4×4 for non-walkers), or you can take the 🚡 Télécabine de la Gorge (this is exciting in itself for little ones; opening hours) / once there, children can paddle or swim in the lake, play with pebbles, take out the mini boats, play in the playgrounds . . . and adults can relax with a cold beer on the terrace of the restaurant, right next to the lake! / there are options for more hikes from here (for example, you can take the 🚡Télécabine du Signal and then hike to the Auberge de la Roselette, via the Col du Joly) / *good to know – if you stay overnight at the Hôtel Bar Restaurant de l’Etape, then you can take the 🚡Télécabine de la Gorge for free! / the MBFF experience: back in 2015, we had an overnight & dinner in the Hôtel Bar Restaurant de l’Etape – it was our luxurious take on a refuge en famille (we weren’t quite ready for dortoirs, being still quite sleep deprived with an 18 month old in tow!) 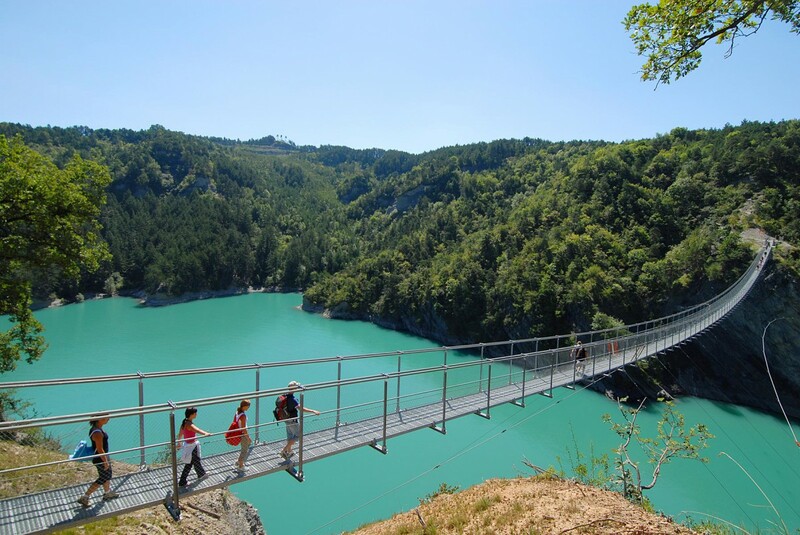 / a visit to this small lake can also combine nicely with the activites on offer in the Parc Patrice Dominguez (Parc du Pontet), or a little overnight camp at the campsite Camping le Pontet! Set below huge cliffs in Montriond, and also know as the lac vert, is the 💦 Lac de Montriond / there are a couple of buvettes / lots of walks in the vicinity of the lake / ☀️ base de loisirs in summertime: special family swimming lake, pony rides, fishing / in winter time, you can practise ice diving here! If you would like to try wake-boarding or water-skiing (from a boat, rather than the roped version of TNA Cable Park), sailing or to hire out a small motor-boat, then you will need to head to the larger lakes of 💦 Lac d’Annecy, 💦 Lac du Bourget or 💦 Lac Léman . . .
💦 Lago de Viverone – only about 1.5 hours from Courmayeur, just after Ivrea, is Lago de Viverone / MBFF has now been to this lake several times – we went to a wedding here one summer and stayed overnight / there are campsites and plentiful hotels and B&Bs dotted around the lake, as well as super restaurants (many with playgrounds!) / take mosquito repellent for overnight stays! NB – fishing in all of France requires a permit (available from Tourist Offices) or you can book to go with a guide / for more information about fishing in Haute-Savoie see here. You’re welcome! Enjoy, and let me know if you have any recommendations to add to the list! Next Next post: C’est La Rentrée!